Available in denominations of £2, £5, £10 and £50, you can choose the value of your gift. 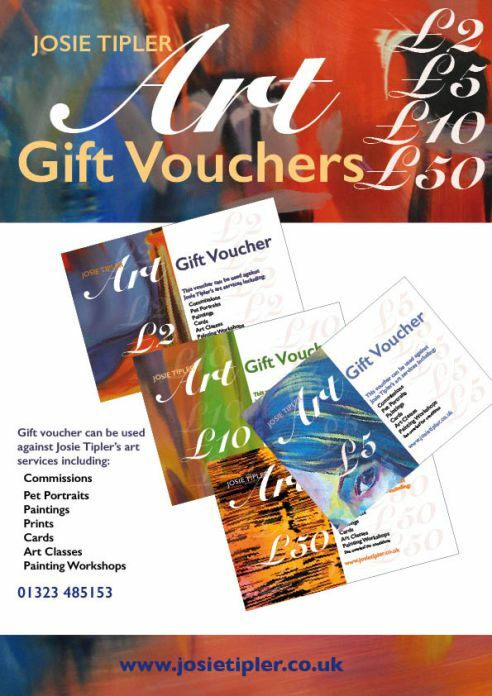 Vouchers are valid for 12 months and can be redeemed against any of Josie’s art services or artwork, including commissions (not just Pet Portraits, Josie paints many other subjects and styles, even undertaking large scale mural projects), paintings, drawings, prints and cards bought direct from Josie, Art tutoring including classes, workshops or bespoke one to one tutoring. If in doubt, contact Josie to order or to discuss how the vouchers can be used. Payment only by BACS or cash for vouchers. Vouchers can only be redeemed when buying direct from Josie Tipler and cannot be redeemed via third parties or at galleries or via online third party websites. Vouchers have no cash value, change will not be given but a balance value may be transferred to lower denomination vouchers at Josie’s discretion.